I WON FIRST PLACE FOR THE MOST UNUSUAL PET! I would like to take this opportunity to thank all the little people and other critters that made this award possible. 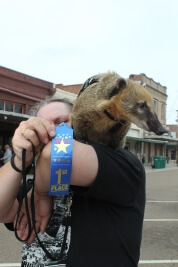 First there is my CoatiDaddy because I’m a Daddy’s girl and I am his favorite (I’m everybody’s favorite). Next there is my CoatiMom, without her all these photographs so you could see me would not be possible. Last but not least all you little people, without my adoring fans I wouldn’t have a kingdom to rule, so Thank you…. Next Next post: Cowgirl Coati!